Whoever thought men can’t steal the show at a red carpet with their killing looks will have their thoughts changed tonight as we have the B-town men winning us over at Tea Valley Filmfare Glamour And Style Awards. Making a drool-worthy appearance tonight were Ayushmann Khurrana, Rohan Mehra, Vicky Kaushal, Mohit Marwah, Vikrant Massey, Aparshakti Khurana, Sooraj Pancholi and Nikhil Dwivedi amongst others. 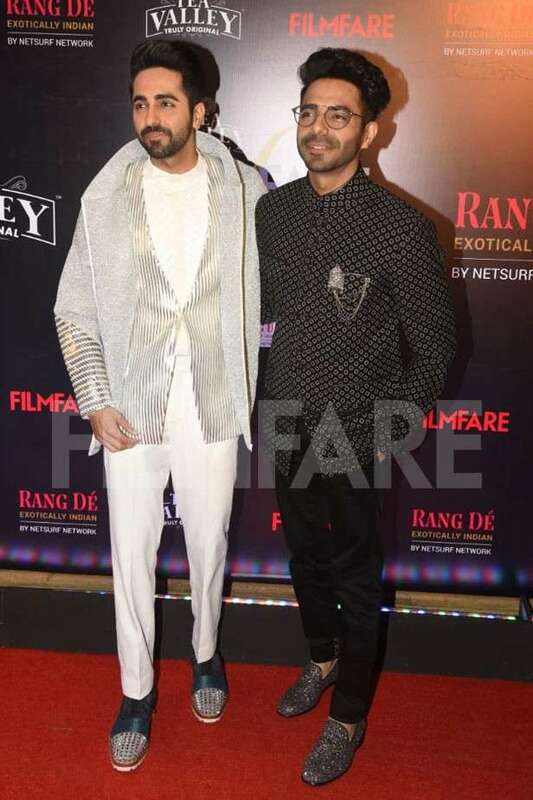 What caught our attention was the major bromance between the Khurrana brothers who kept it Indo-western in their classic all white and black looks. Meanwhile, making everyone scream in there was Vicky Kaushal who wore a silver blazer with white tee and pants. Also winning us over were Rohan Mehra, Mohit Marwah, Sooraj Pancholi and Vikrant Massey who looked their fashionable best at the annual gala. Without waiting any further, you check out their pictures here. Enjoy!